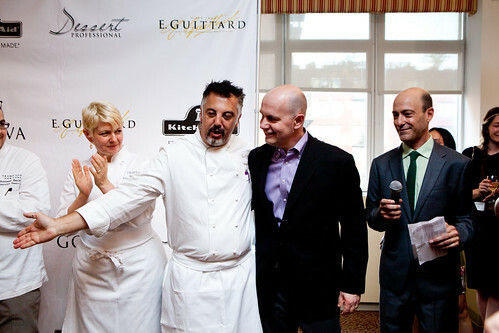 Last night was a sugar, chocolate, butter, and cream-filled evening of all things pastry, as Dessert Professional magazine picked the Top 10 Pastry Chefs in America 2011. 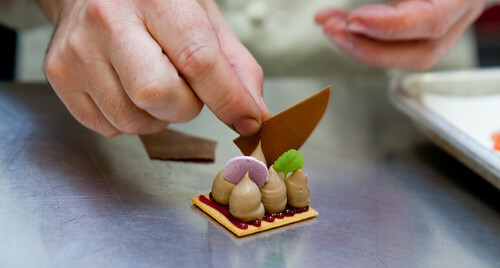 It’s an industry event where press, chocolate companies, restauranteurs, and pastry chefs meet at the ICE (Institute of Culinary Education) to taste the top 10 chefs’ sweet offerings. Four of them are found within the NYC area, the other six are out in the West Coast. 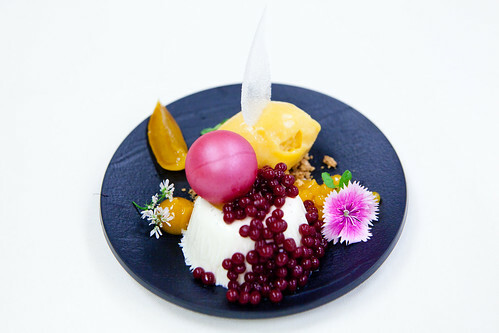 The most stunning and complex plated dessert was Panna Cotta with Peach sorbet, Morello cherry and peach pearl, cherry gel sheet, and cellophane of sugar from Pastry Chefs Antonio Bachour and Marcello Guevara from Trump SoHo restaurant’s Quattro in NYC. It is certainly delicious as it looks. 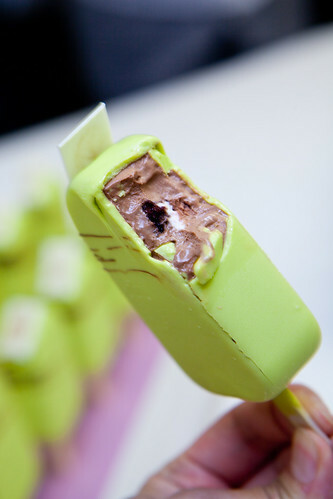 The Black Forest Pop filled with dark Chocolate mousse with creme chantilly, chocolate blackout cake & Amarena cherries in a tempered, pistachio green colored white chocolate shell from Culinary Institute of America‘s Assistant Professor and Pastry Chef Francisco Migoya. It even caught the eye of the goddess of cakes and bread cookbook author and blogger, Rose Levy Beranbaum. It’s whimsical and delicious. 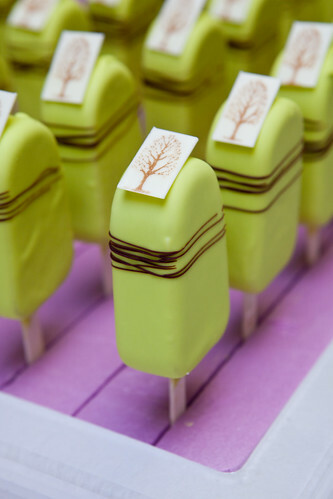 If Chef Migoya made this popsicle half its size, it would be easier to eat since there’s so much more desserts to sample at this event (that’s my only little suggestion). 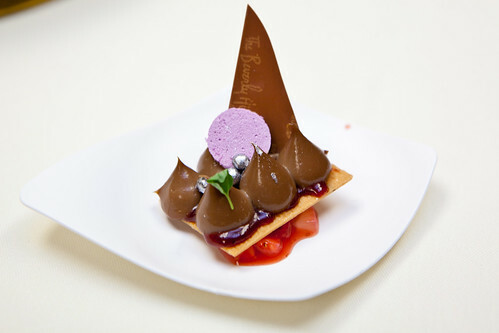 From Chef Jean-Francois Suteau, The Beverly Hills Hotel, Beverly Hills, CA, his dessert was the “Caramelia-Strawberry-Cassis.” A wee dessert that packs a lot of flavors from the new Valrhona milk chocolate couverture Caramelia with lush seasonal spring flavors. 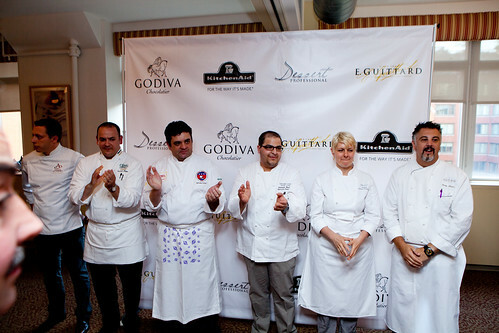 Congratulations to all the chefs! I hope one day I would be able to visit your proper restaurants and eat there soon.